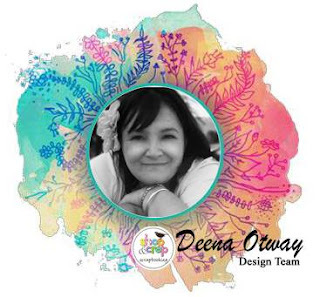 And can't wait to play with them... but I guess everyone gets so excited to play when the get awesome paper goodies..
it's Deena here with you today. I love receiving my design team packages because you never know what is going to be in them. 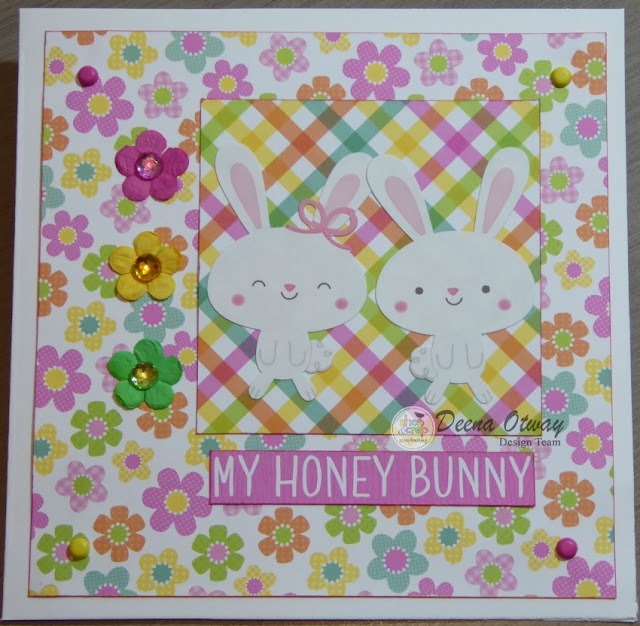 In the box was the March 2017 Crop Kit which is Easter themed and is available to be purchased in the shop. 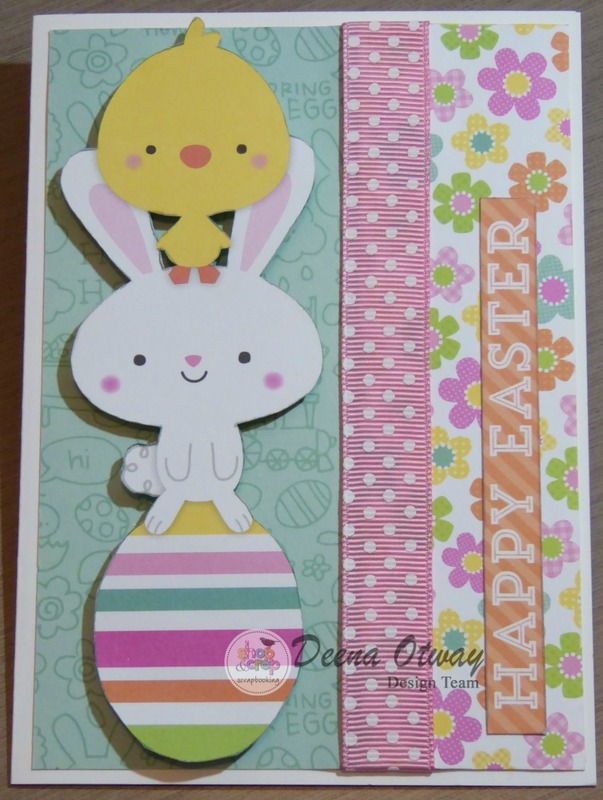 Now that Easter is over with and the kids are all back at school you can pull out your kit and create the two layouts designed for the kit or something entirely different. 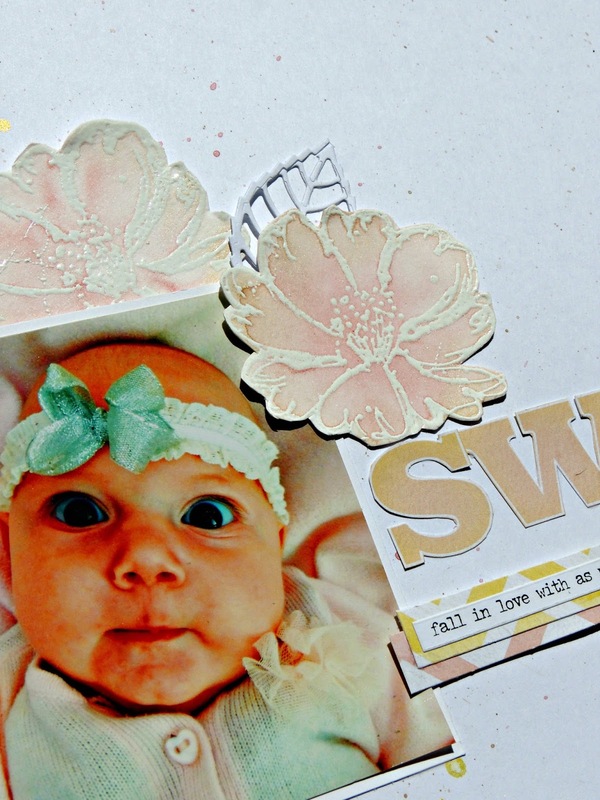 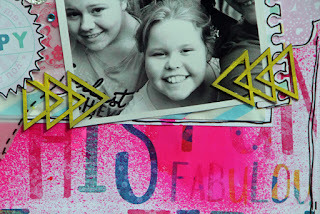 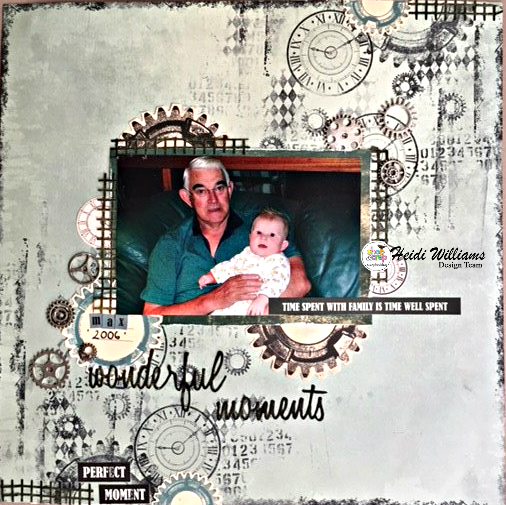 I want to show you what you can create if your not a scrapbooker or if you have left overs. 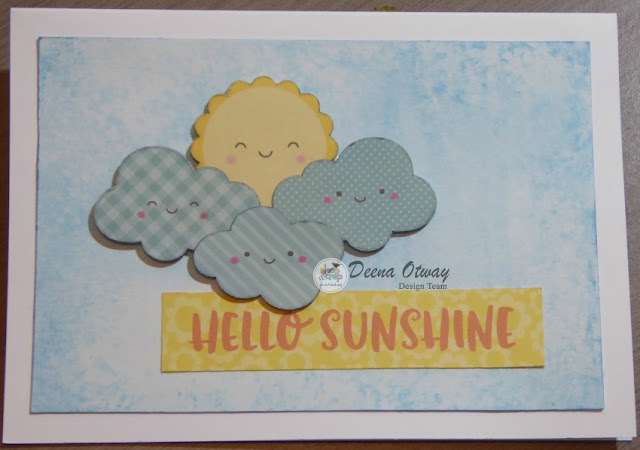 I know this card is pretty simple but I just wanted to remind you that you don't need complete sheets of paper all the scraps that you have laying around can be turned into a quick and simple card. 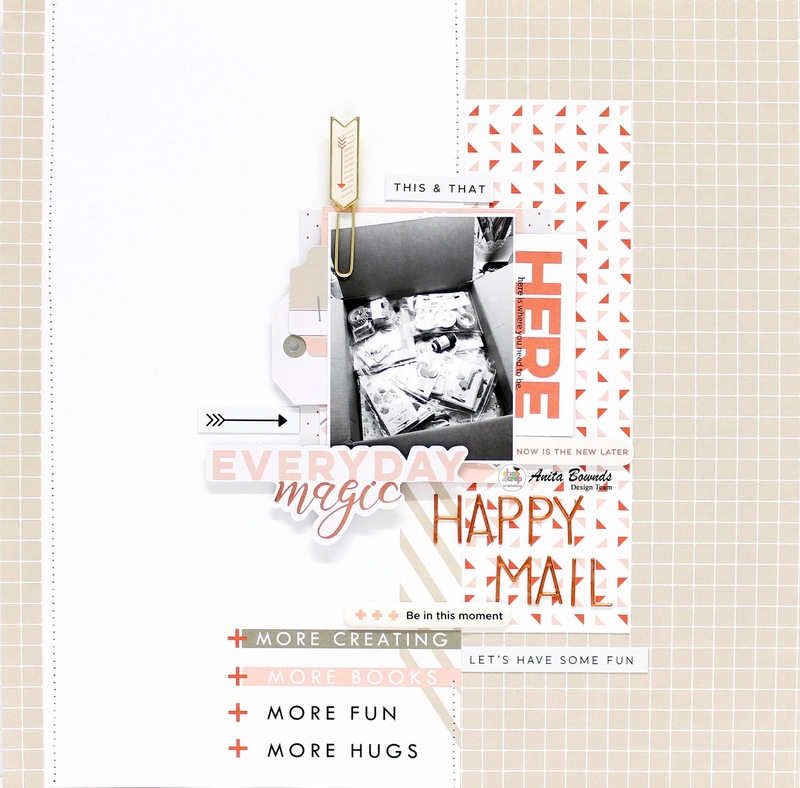 Crop Kits are our monthly kit containing approx $30 worth of co-ordinating products and instruction sheets for two layout designs for just $29.95 per month (for subscribers). 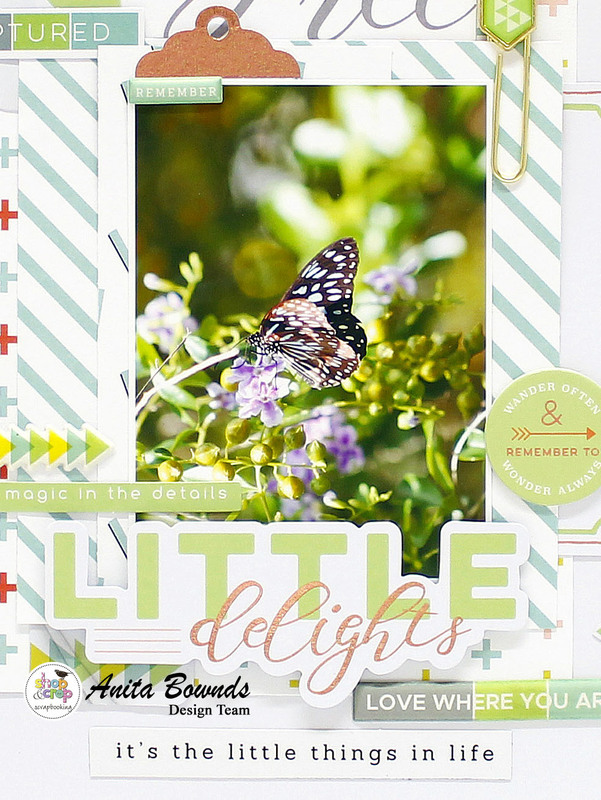 Subscribe today for this fantastic kit. In each kit you will receive the instructions and materials for the two layouts in the kit. 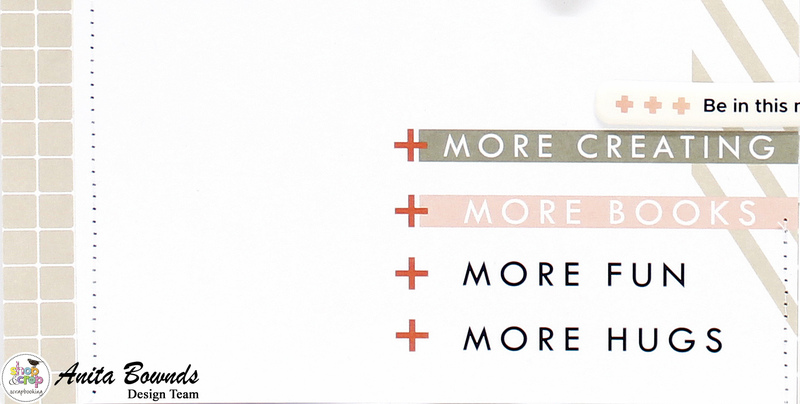 Subscriptions are for a minimum of 6 consecutive monthly payments of $29.95 plus postage per month. 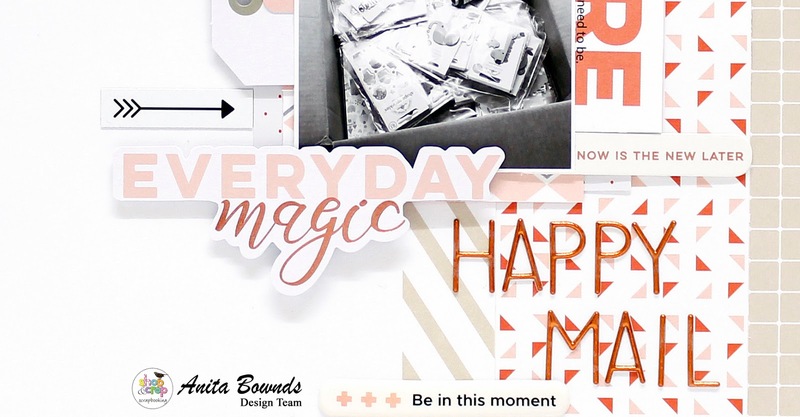 You will pay for your first month's kit when you place your initial order . 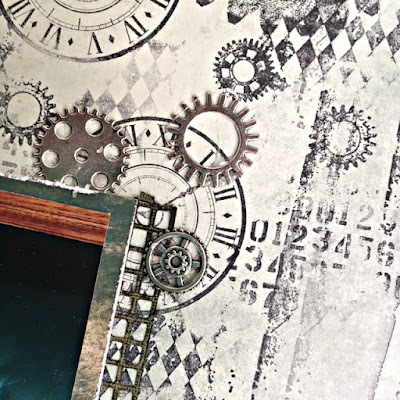 This initial order is your acceptance that you have signed up for a kit subscription .Automatic Recurring Payment is processed via our secure gateway payment , with payment taking place on the 10th of the month. 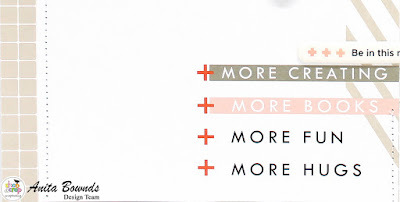 credit card payment is preferred , but Paypal is an option but it does incur a $2.50 extra processing fee each month. If your credit card payment declines then a $20 reprocessing fee will apply . 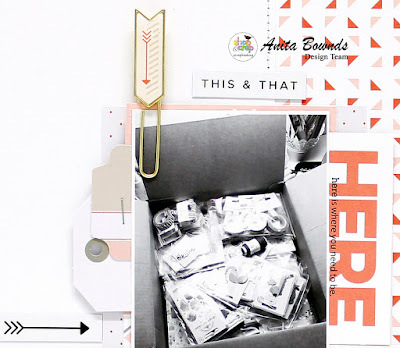 Typically we ship our Shop and Crop Kits between the 15th and the 17th of each month. 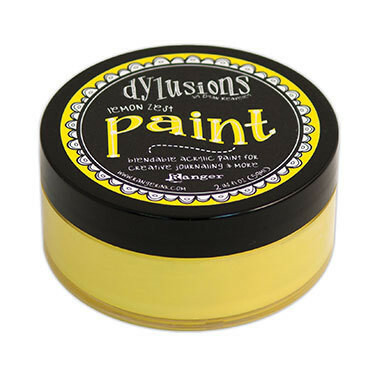 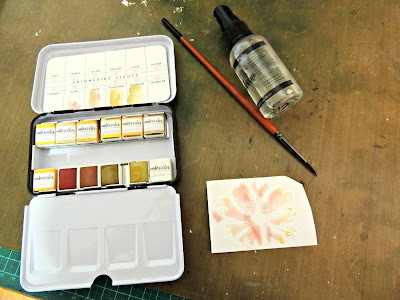 However since we try to include the most current products in our Kits, occasionally we experience minor delays in receiving products from our manufacturers. 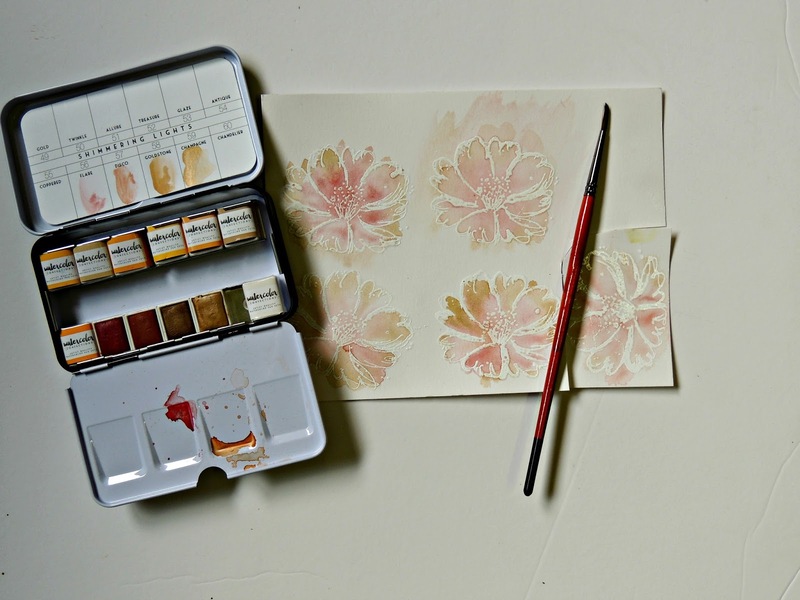 When these circumstances arise, our kits will ship as soon as the products arrive. 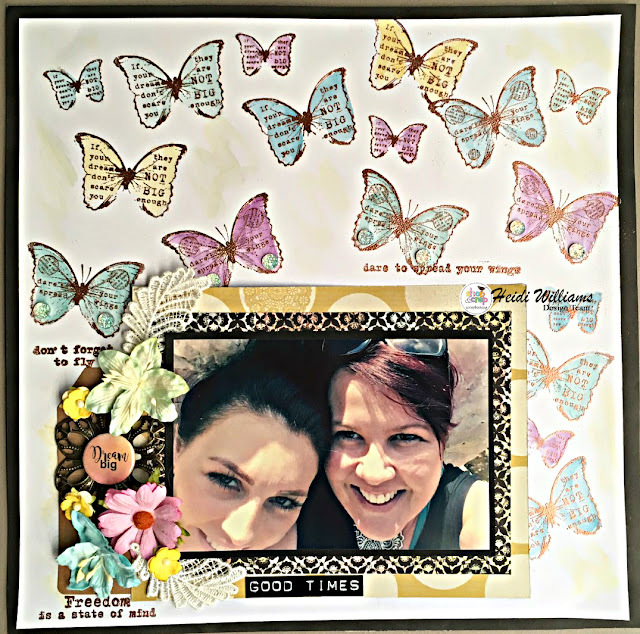 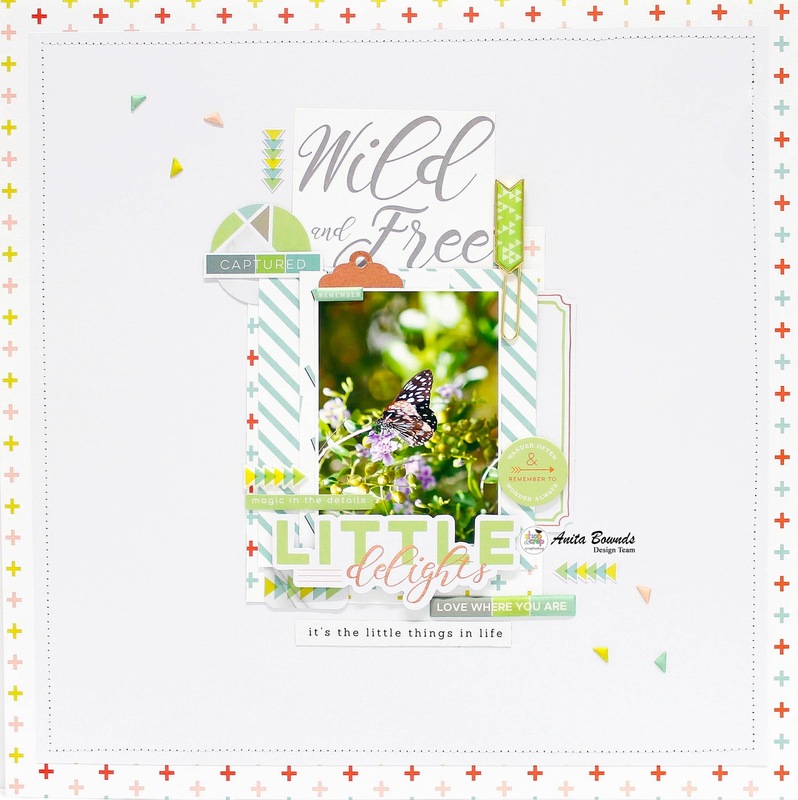 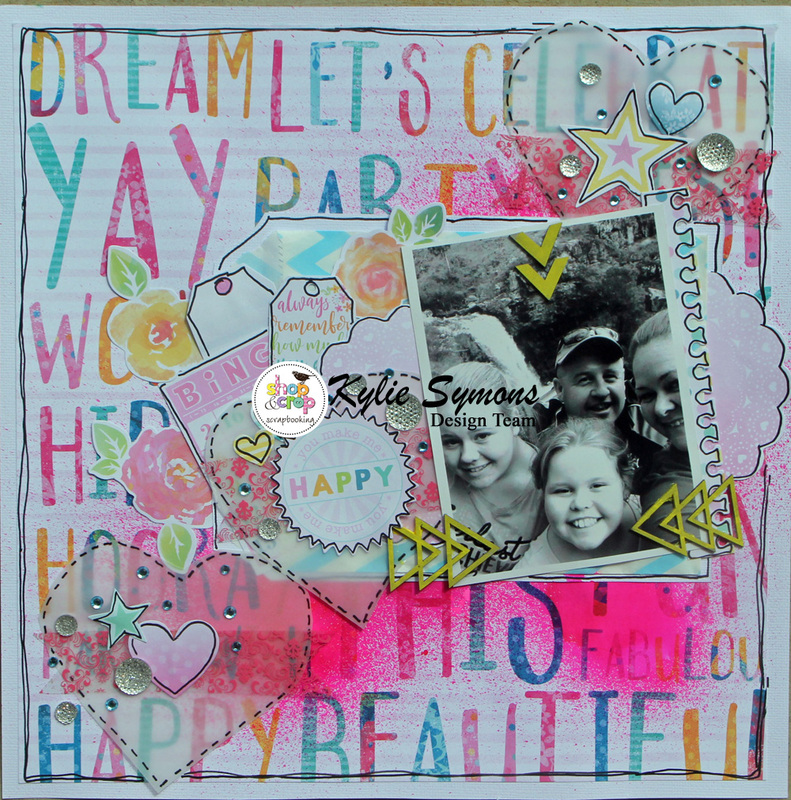 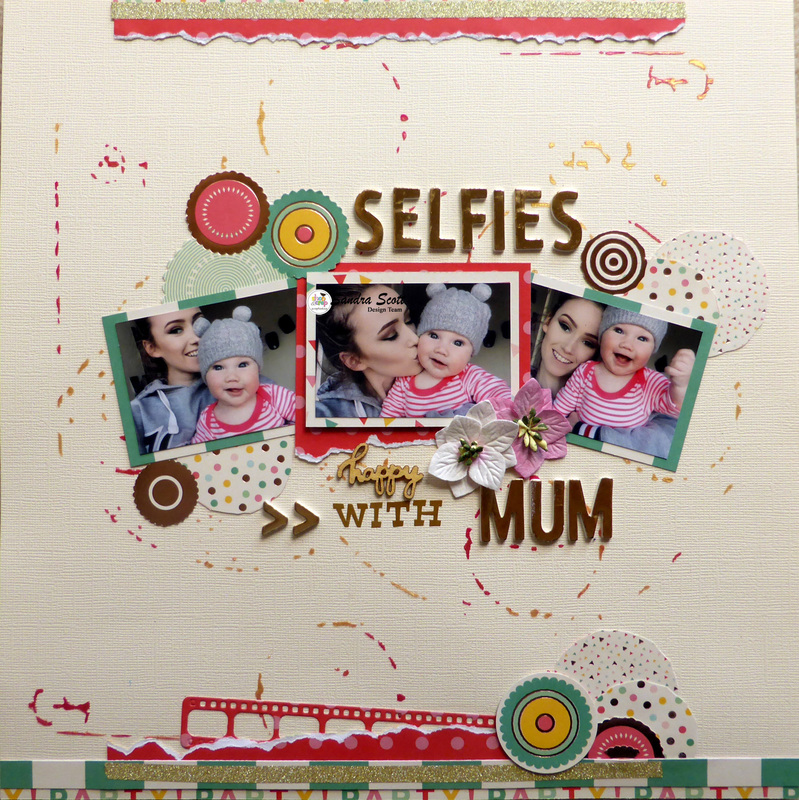 Good morning everyone, Sandra here with a layout from the My Mind's Eye Hooray Collection from the Shop and Crop Store. I chose my photos to suit the collection and I was lucky enough to have a few of these gorgeous selfies of my granddaughter and her daughter. 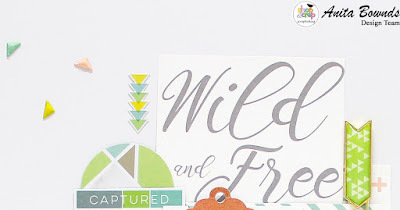 The photos were so playful I wanted to add some fun on the background so used one of my favourite stencils from TCW with another product that I love and you can find in the Shop and Crop Store - Colour Blast Paste. 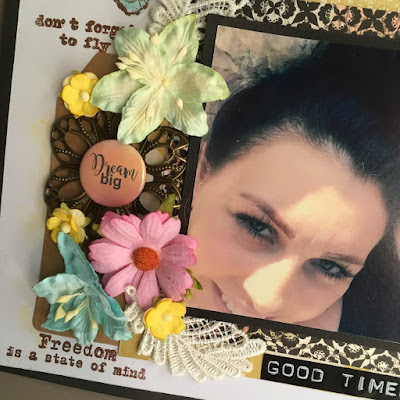 I matted my photos with the patterned paper and fussy cut one of the sheets with all those gorgeous circles which I felt blended with the circles of the stencil. I layered some strips on the top and bottom of the page to make it feel more grounded. 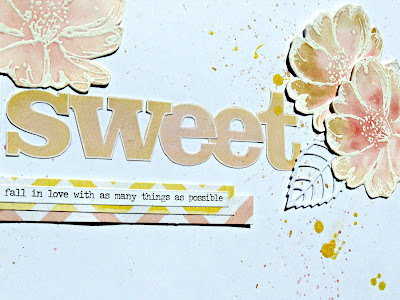 I'm loving gold at the moment so added some narrow gold washi tape from my stash and finished with the gold alpha. 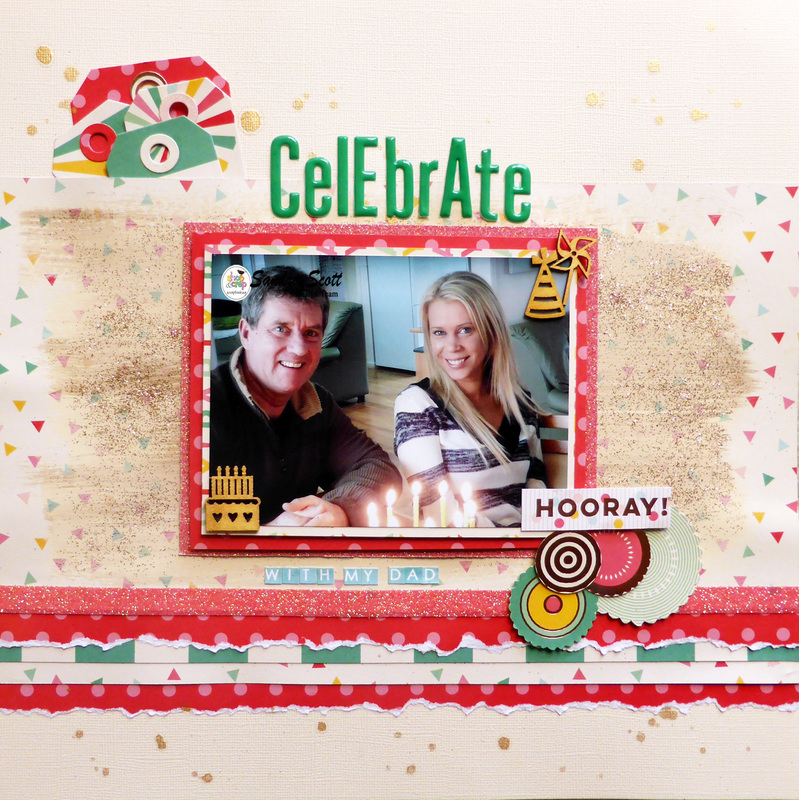 My second layout with the same range was for an adult birthday celebration. Similar to the first one I layers strips of paper to the bottom of the page including my pink washi tape (loving the bling) and to bling it up a little more I sprinkled glitter on the background under my photo. 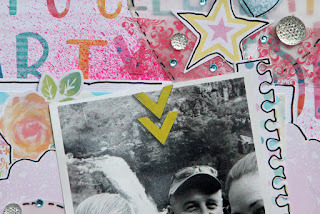 I cut the tags with a die and layered them above the photo as well as fussy cutting some circles for under the photo. 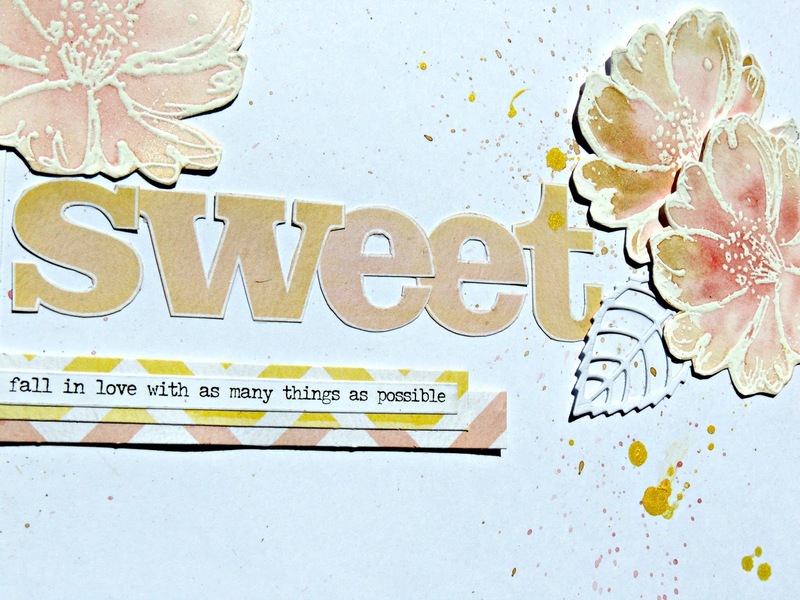 I coloured the wooden embellishments with Brilliance Gold Ink. 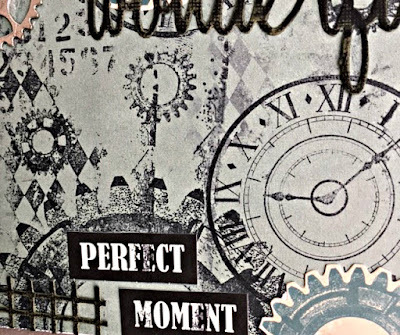 Thanks for stopping by today and remember if you'd like to purchase from the store you can use the code SS5 to receive a discount. 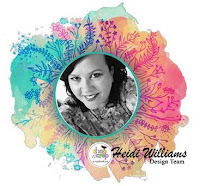 Hi Heidi here today sharing with you my page which is in our challenge this month .. I did stamping and embossing and cardstock as its a tic tac toe challenge..
Elisa here from the design team with my take on this months 'tic tac toe' challenge. 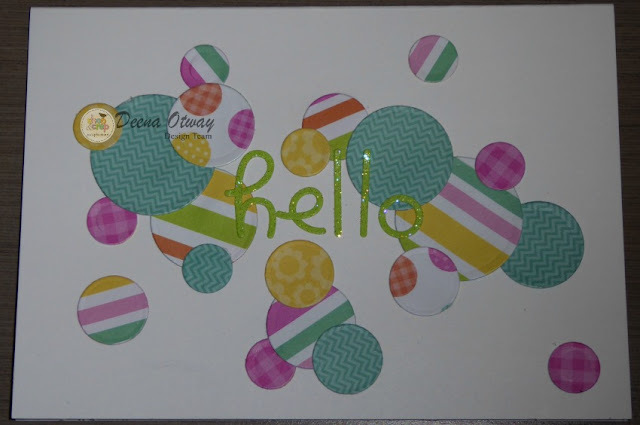 I decided to go diagonally across the board - stamping, embossing powder and cardstock. 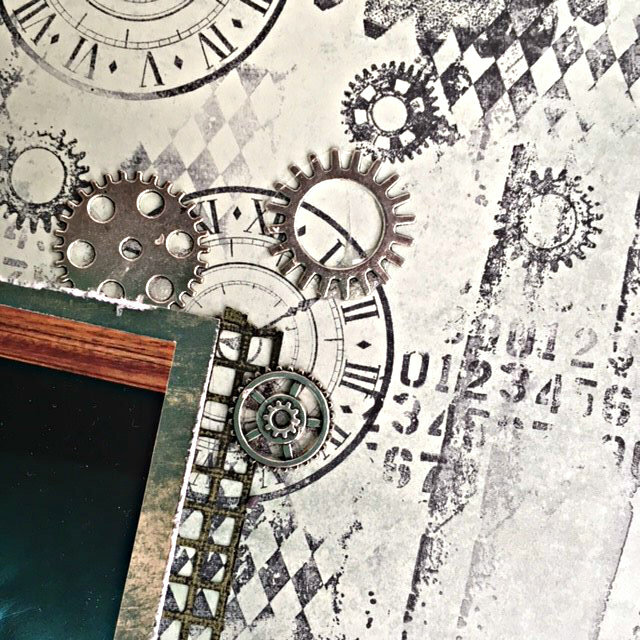 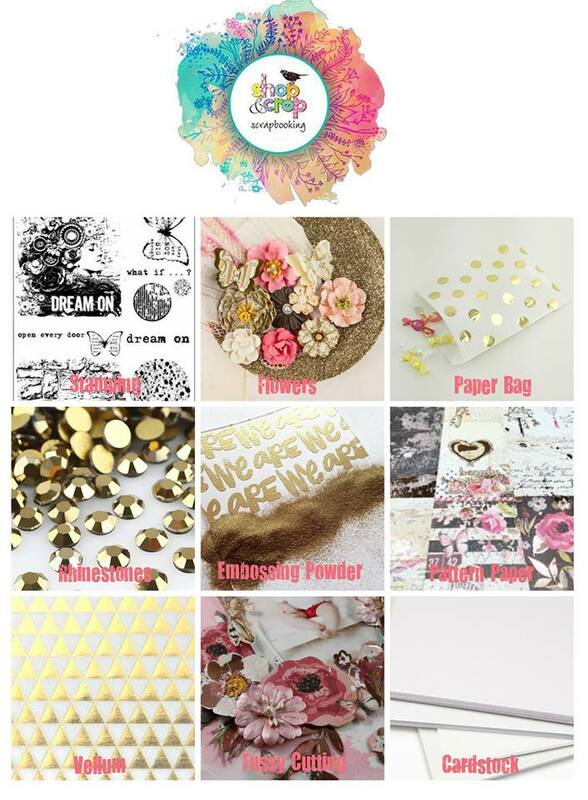 Don't forget when ordering from Shop and Crop Scrapbooking you can use the code EA5 for a discount at the checkout. 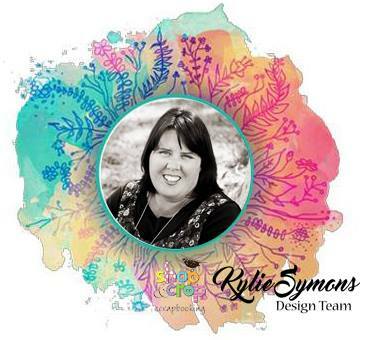 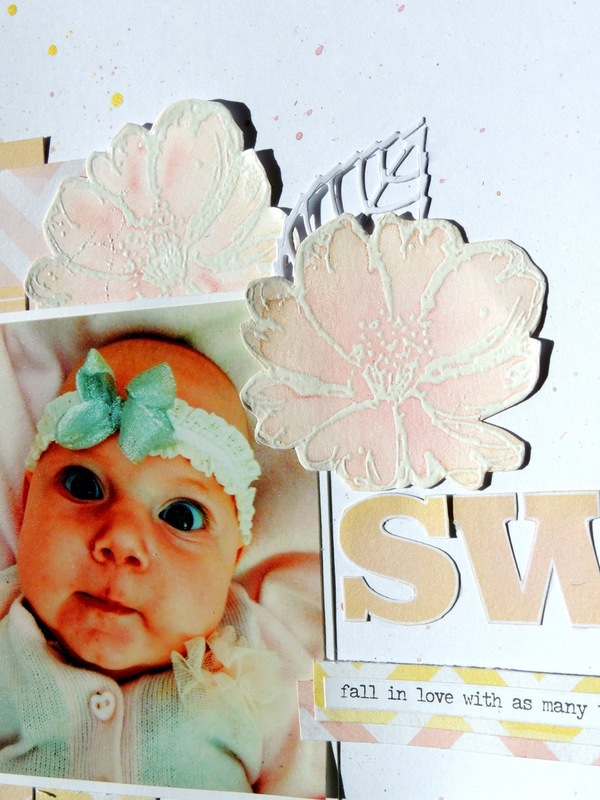 Here is my layout - feminine with a gorgeous colour combination of pinks, golds and yellow. 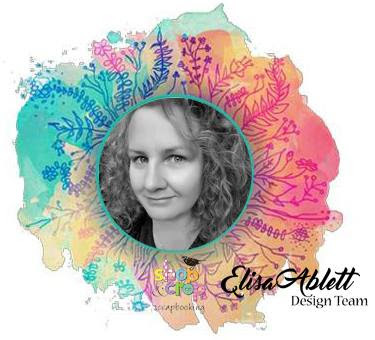 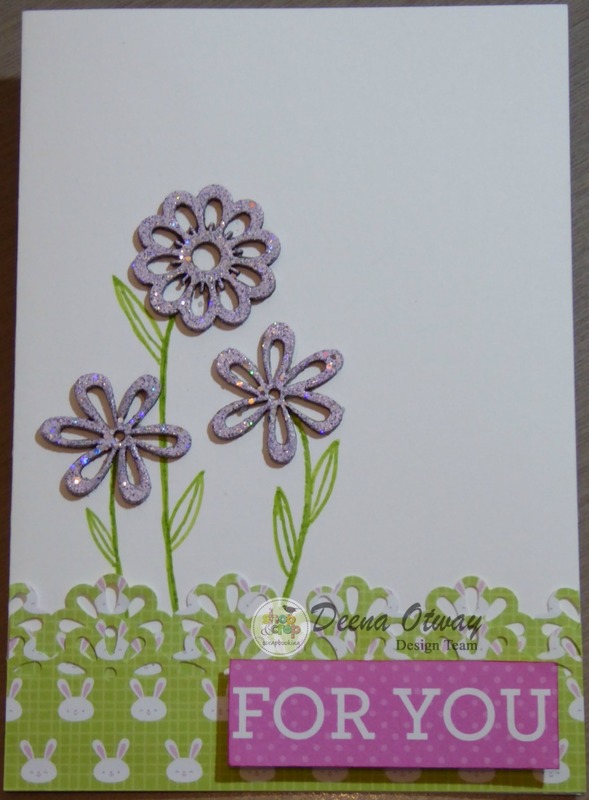 I have a little step by step tutorial on how I created the flower embellishments on my page. 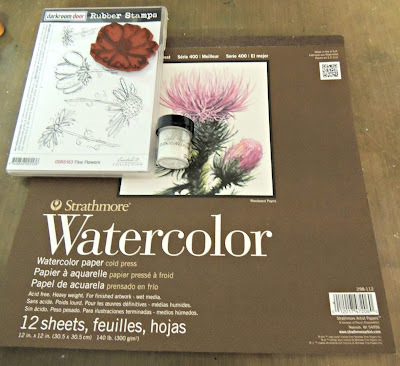 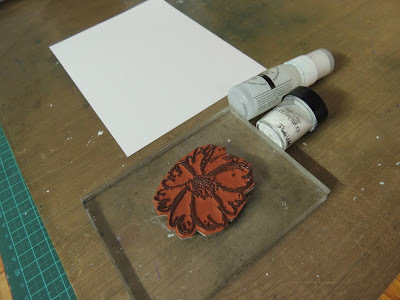 Step 1 - Using a good quality watercolour paper, stamp and embossing powder (Lindy's Embossing Powder in white). Step 2 - Cover your stamp with embossing liquid or use an embossing stamp pad and heat emboss your stamped image. 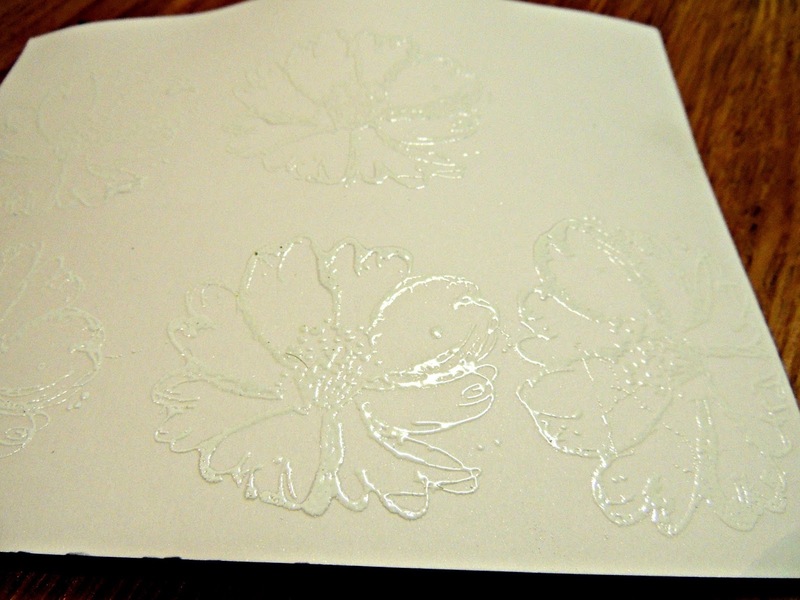 Step 3 - repeat until you have stamped, embossed and heat set at least 5 to 6 flowers. 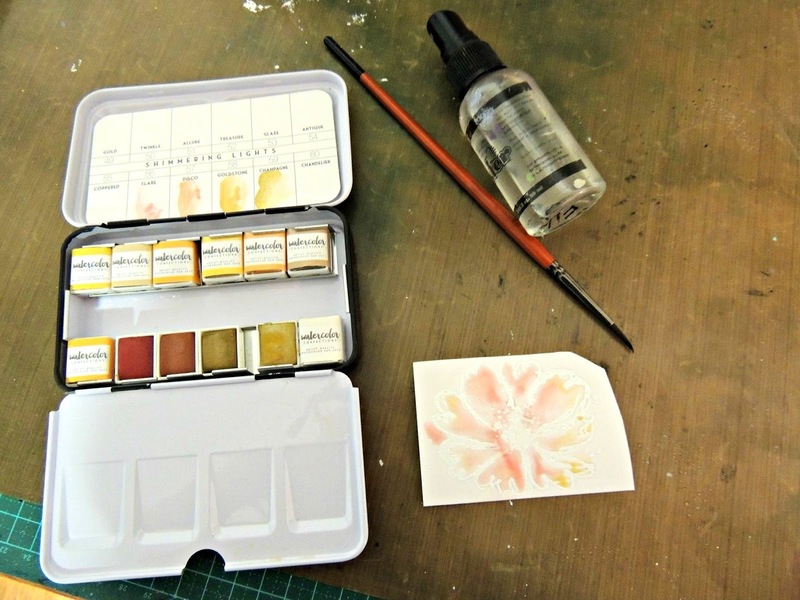 Step 4 - Open your tin of Prima Watercolour Pans - shimmering lights and using a spray bottle and paintbrush add colour to your stamped images. Spray your stamped image first with water. Add water to your chosen colour on your palette and using a wet paint brush move it around your stamped image. 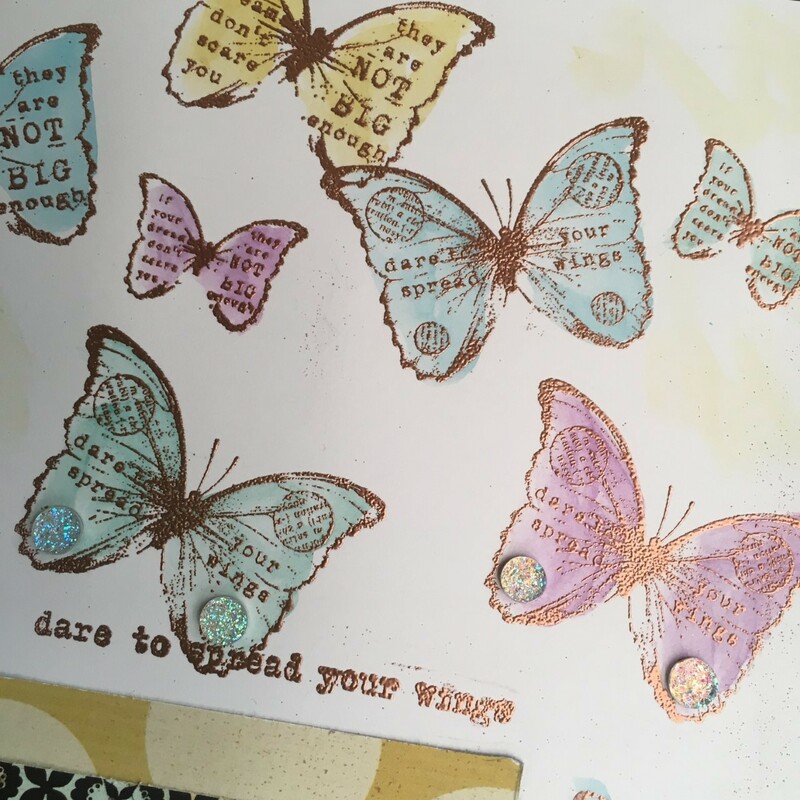 The embossing creates a resist effect for the watercolour. 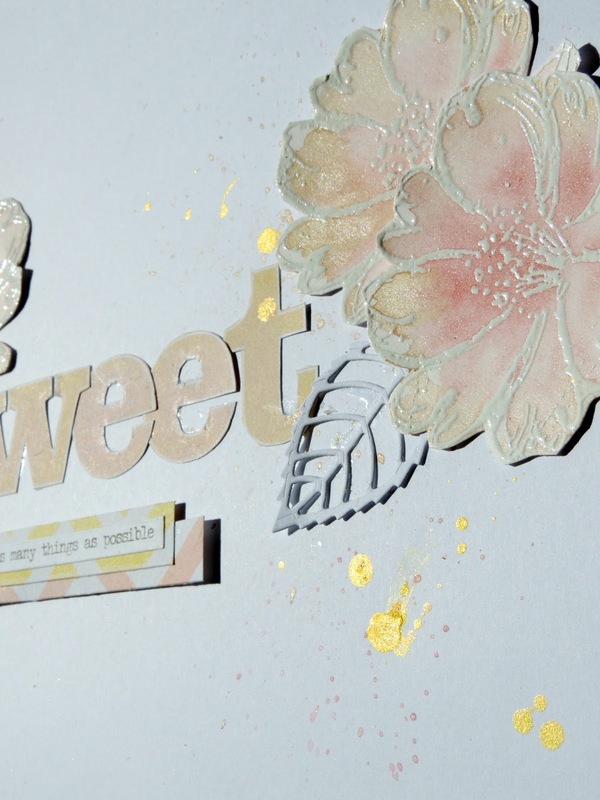 Step 5 - Keep adding colour to your flowers, then once dry, splatter your flowers with gold splatter and fussy cut them out. 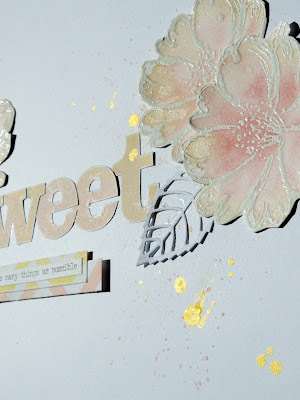 Splatter your layout with the same gold splatter - I used a combination of Bling Colour Blast Shimmer Spray and watered down shimmering colour. Today i'm going to share with you my example for this months challenge. Pick a Line and Create ; can be vertical, horizontal or diagonal has to include items in the line (you can include other things on your layout but we must be able to see the line you picked). 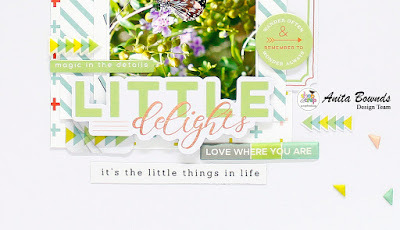 Please note this isn't a colour challenge ! 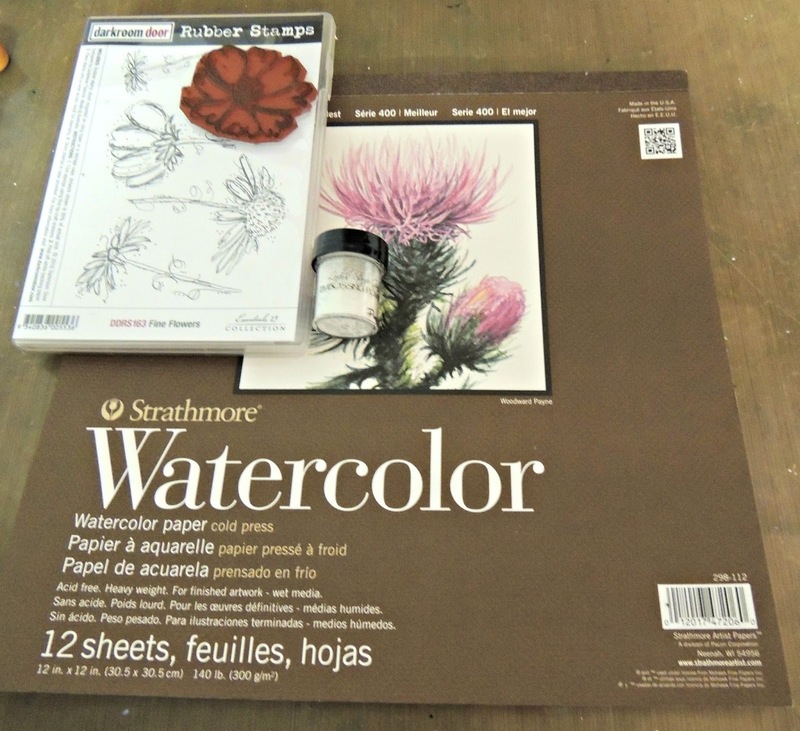 I decided to use the cardstock, Pattern Paper and Paper bag with vellum chucked into the mix. 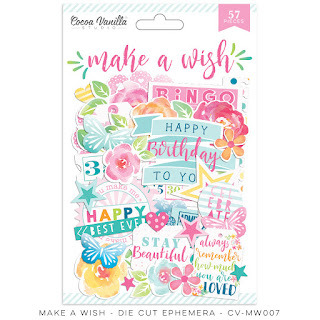 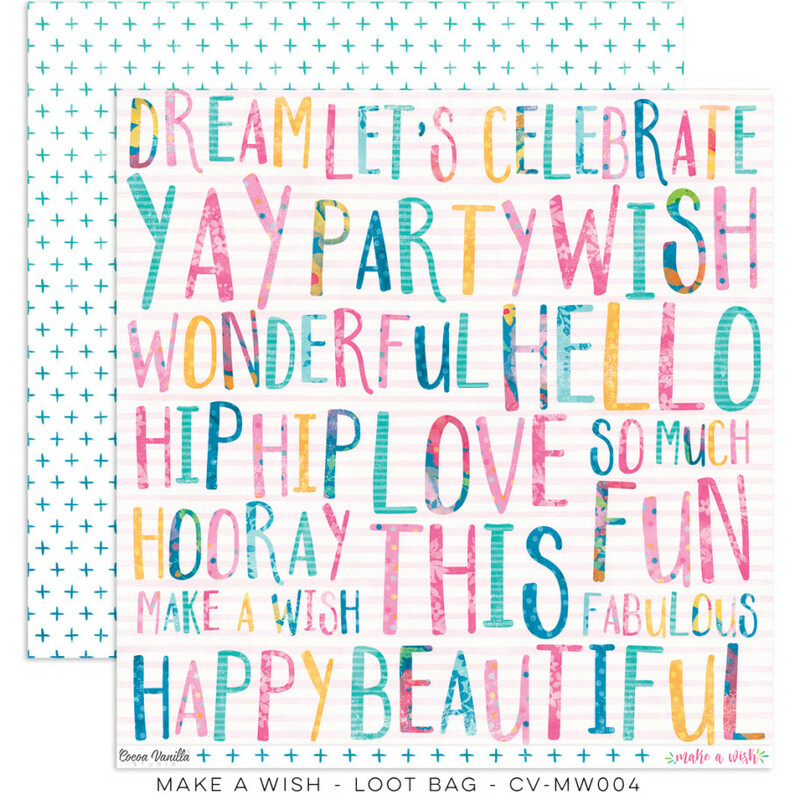 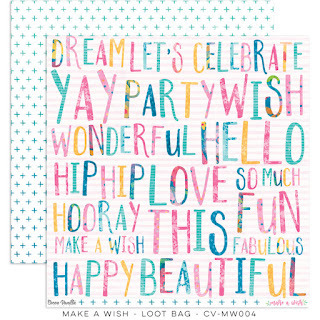 I have used the Cocoa Vanilla Make A Wish paper range and Ephemera. 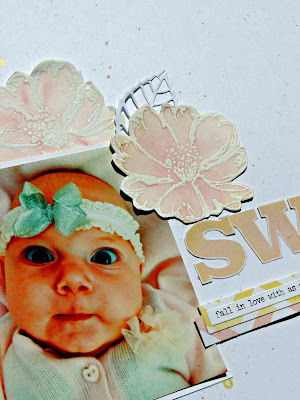 A Little Carta Bella "It's A Boy"
Kaisercraft Kit - Baby Girl creations.